Alyssa Ostash passed away at Canuck Place, surrounded by her family when she was just 14. 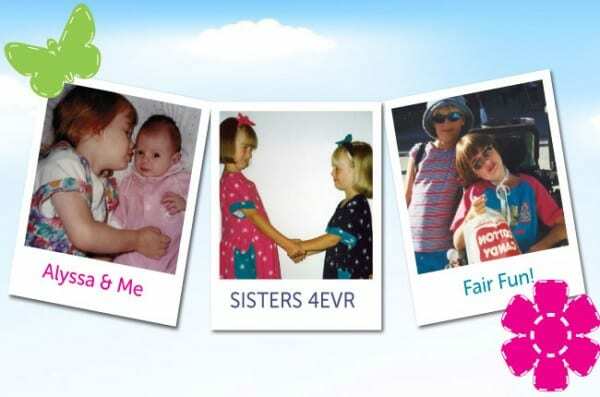 Not only was Canuck Place there in the last years of Alyssa’s life, but they supported her family, including her younger sister Jenna in the years since. Jenna has since grown up, and recently graduated from the University of British Columbia. She now hopes to complete a Masters in Counselling Psychology and work somewhere like Canuck Place, where she can pass along the support she’s received for so many years. Looking to give back to Canuck Place, Jenna wrote us this letter about her sister. The bond between my sister Alyssa and I, is something that will never break. And never fade. Not even now that she’s gone. Alyssa was diagnosed with a rare form of muscular dystrophy at the age of 10. Her brain couldn’t tell her body to work properly. She couldn’t walk, talk or breathe on her own. But that did not stop her from living life to the fullest, and it did not stop us as a family. I couldn’t be luckier to have had Alyssa as my sister. She was two years older than me. I looked up to her so much. She was bright, kind-hearted and so passionate about life. For Alyssa, Canuck Place helped her to just be a kid and enjoy so many wonderful things. Those memories that we made together are what kept my family going. And they still do today, 11 years later. In Alyssa’s last days the people at Canuck Place did everything they could to make it the most comfortable and peaceful passing. That night, for some reason, I insisted I wanted to be with Alyssa. I’m sure she knew I was there. She chose to leave when I was with her. I miss my sister every day. I miss dancing with her in our living room after dinner. I miss her passion for living life to the fullest. I miss learning from her. But thanks to the help and support by the experienced counselling team, we have been able to survive this enormous loss. Nobody should lose a sister. No parent should lose a child. But I can tell you that Canuck Place and the wonderful people there did all they could to lessen this tragedy just a bit, by making Alyssa’s ordeal as painless and peaceful as they could, and by helping us make memories to last a lifetime. Help Canuck Place continue to provide support to families like Jenna’s. Donate today.